Football fans are in for a pretty cool treat today. Glu, the developers behind Racing Rivals, just announced that Tap Sports Football has been released for Android. The game allows you to build and manage a team of professional Football players, make strategic decisions and compete against friends on your phone or tablet. As always, we provide you the APK file of the game so you can download Tap Sports Football APK here. • Current Professional Players – Choose from your real-life favorite professional football players, sign them to your team and climb the standings! 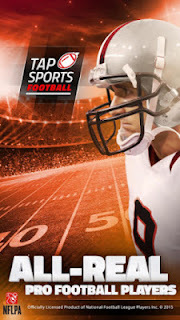 • Easy One-Touch Controls – Tap to pass and watch your receiver pull it down in the end zone! Avoid blockers and perfect your timing to gain yards on your opponent. Simple controls and short gameplay sessions let you play anywhere, anytime! • Challenge Your Friends – Link your Facebook account to invite and play against your friends! • Compete in Events – Dominate your friends or other players around the world! Win the league’s best players in events and take your team to the next level! • Employ Real Football Strategy – Decide whether to run or pass the ball, whether to kick a field goal, punt, or go for it on 4th down! Blitz the quarterback or play it safe on defense – these and other real football strategies are all included! You can check it out on the Google Play Store now or download Tap Sports Football APK file from the source link below.